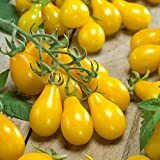 Pear tomato growing herbaceous of the genus Solanum, Pear tomato annual to short perennial evergreen plant, perennial tomatoes suffers or die due to the cold of the winter, in less cold area, there are varieties that can survive the winter, vegetative reproduction can maintain high quality seedlings in the greenhouse to next season, Pear tomato grows as vine, shrub or subshrub, can grow in tropic, subtropical, mediterranean, temperate or desert climate and growing in hardiness zone 10b+ as perennial 2+ as annual. 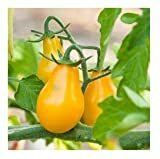 Pear tomatoes appear in a variety of colors: red, yellow, the shape is pear shape, size can be normal size or cherry. 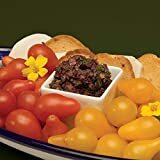 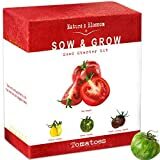 Nature’s Blossom Tomatoes Seed Kit - Grow 4 Kinds of Tomato; Sweet Red Tomato, Cherry Tomatoes, Yellow Pear Tomato & Green Zebra Tomato. 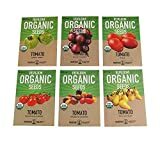 Complete Starter Set W/Soil, Pots, Labels & Guide. 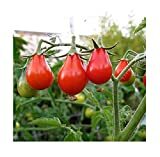 When does Pear tomato yield? 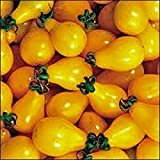 What can be done with big quantities of Pear tomato fruits?